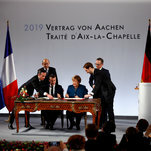 On Tuesday, Chancellor Angela Merkel of Germany and President Emmanuel Macron of France met in a German city symbolic to both — Aachen, or Aix-la-Chapelle in French — to renew that commitment for the 21st century, in a ceremony that nevertheless served as a reminder of the daunting array of challenges threatening Europe today. The leaders and their countries, former enemies who lost millions in wars last century, form the staunchly pro-Europe core of the Continent. But with Ms. Merkel already on a glide path out of power and Mr. Macron severely weakened by popular protests at home, their simultaneous decline is threatening to leave a crater at the center of Europe’s decades-old project of unity. Internal and external forces continue to raise the prospect of a fracturing of the European Union. Britain is scheduled to leave the bloc on March 29. The Trump administration is threatening tariffs and questioning Washington’s commitment to NATO. Populist governments in Hungary and Poland are challenging fundamental principles of liberal democracy and the rule of law, and Italy is challenging traditional liberal values. The French-German friendship has served as the backbone to the European Union as it grew from a predominately economic alliance of West European countries to a political bloc of 28 stretching across Europe. Yet many of the newest members, particularly in the East, look warily at the strength of the friendship between Paris and Berlin. While the “Franco-German couple,” as the relationship is commonly called in France, remains vital to the Continent’s future, critics say the new treaty is a relatively weak renewal of vows. It also risked angering many of the two countries’ smaller European partners, who increasingly bridle against what they see as the imposition of German and French priorities, especially when it comes to budgets and migration. As if a further reminders were needed, a diplomatic spat this week between Italy and France proved the point. Over the weekend, a deputy prime minister of Italy, Luigi Di Maio of the populist Five Star Movement, called on the European Union to impose sanctions on France for its policies in Africa, “which are impoverishing these places” and encouraging migration. Ms. Merkel herself has been a source of disappointment for Mr. Macron. Her natural caution has been cold water to his impassioned plans for European reform, especially for the countries that use the common euro currency. Most of his lofty visions, like a shared eurozone budget, have been watered down or have come to nothing. But Ms. Merkel also wants to support him and his commitment to Europe, especially when he is in difficulty at home. Each leader acknowledged the challenges, but drew on them as reasons for the new treaty. The new accord includes pledges to deepen economic integration through a joint “economic zone,” and to reinforce cooperation in military purchasing and coordination with the aim of improving Europe’s ability to act on its own. It includes a mutual defense pact, within the context of NATO membership, and would establish a joint defense and security council. Both Mr. Macron and Ms. Merkel have called in their own ways for a European army capable of acting alone when NATO does not wish to be involved. Both have also said that Europe can no longer count on the United States, as it has in the past. That idea created anger and concern in Washington and set off a series of contemptuous remarks over Twitter from President Trump. “Europe is the protective shield for our people against the new storms in the world,” Mr. Macron said. Beyond Europe, the treaty also promises that France and Germany will “coordinate closely” in its positions at the United Nations, where France has a permanent seat on the Security Council and Germany, despite its size and largely because of its history, has none. It includes a pledge to work together to increase renewable energy on both sides of the Rhine and a common path toward upholding their commitments to the 2015 Paris Climate agreement, points that could help serve Ms. Merkel’s efforts to cement her legacy as the “climate chancellor,” despite Germany’s struggle to cut its carbon emissions. There are plans to deepen ties between the countries’ combined populations of nearly 150 million, through cultural exchanges and language lessons, an emphasis on bilingualism for the border regions, and improved rail and other infrastructure connections. Mr. Macron’s office issued a formal rebuttal of what it called “scandalous false information,” listing the assertions that had been circulating and outlining what is stated in the treaty. The contentious debate in France that preceded the signing of the document reflects the danger the French-German relationship poses to Europe in the 21st century, when many of the countries’ European partners view the strength of their ties not as an engine driving the project but as a directorate. While the strength of the document lies in its bilateral elements, Mr. Techau expressed doubt that the international elements would inspire deeper allegiance to the European project from other members of the bloc.